Much like the cliché of many a footballer stumbling to find the right words in a post-match interview, we expect 2019 to be a game of two halves for the South African rand. The first half of the year will likely see a poor performance for the local currency with a higher USD driven by increased interest rates and the continued uncertainty driven by the US-China trade dispute. We see May as the month however wherein this could change with elections due and a result expected that will continue to give President Ramaphosa enough of a mandate and backing to continual the structural reforms that he was elected to fulfill back in 2016. 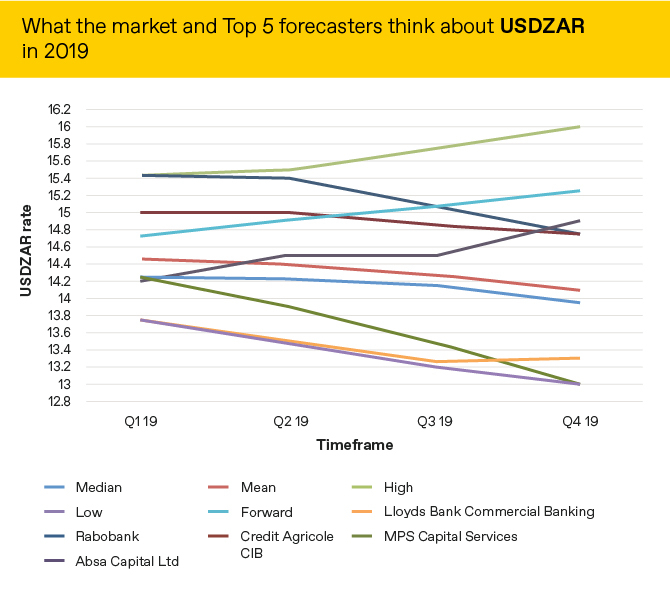 Market expectations of what will happen to the ZAR versus the USD are below alongside the predictions of the 5 most accurate forecasters as measured by Bloomberg.